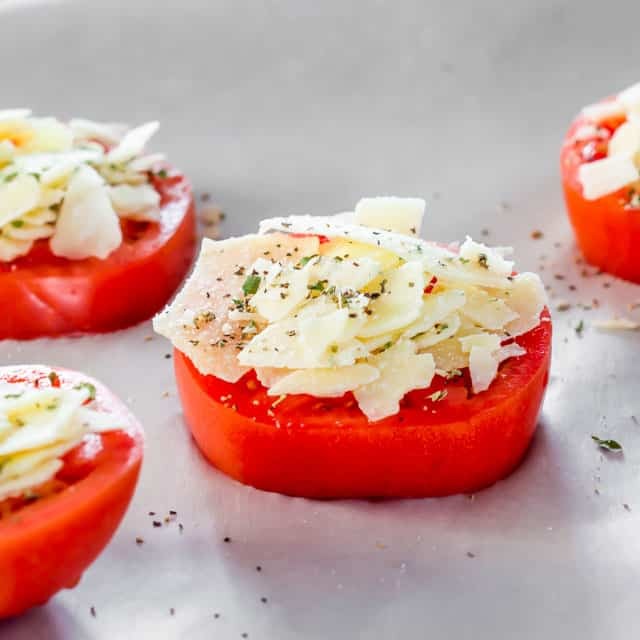 Baked Parmesan Tomatoes – super simple appetizer and a fun way to eat your tomatoes! Magic happens when you pair together tomatoes and Parmesan cheese. This week has been the longest week ever. But I say that every single week. I love Fridays, hate Mondays and everything in between, blah blah blah blah blah! That’s the bad news. The good news is I have a new favorite appetizer. And that’s these tomatoes here! Seriously, it’s my new favorite way to eat tomatoes. 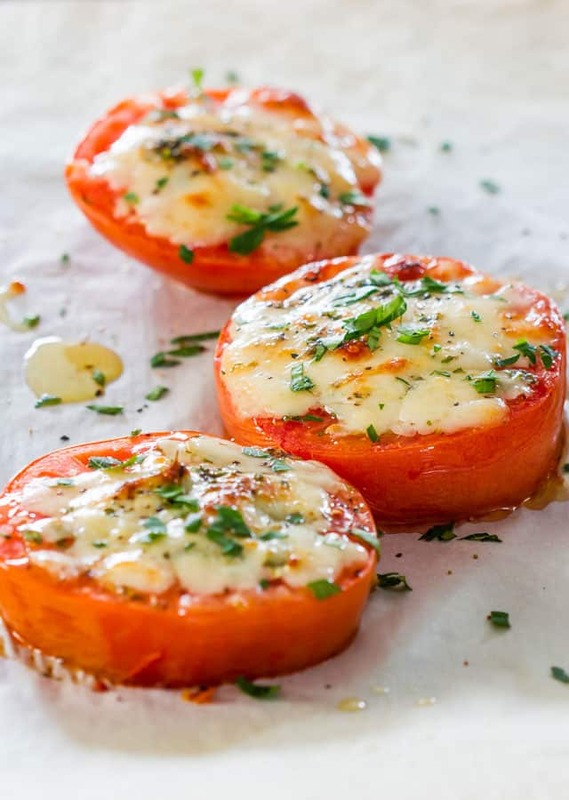 These baked Parmesan tomatoes are the bomb!! Strong emphasis on the word baked, hence good for you. It’s almost magical when you pair together tomatoes and Parmesan cheese. I don’t know, but these two ingredients are a marriage made in heaven. Who ever invented this combo knew what they were talking about. So I thought it’s only fitting I give you guys a couple tomato jokes, because you know, tomatoes are funny. Q: How do you get rid of lazy tomato employees? Lame, I know. But funny! These baked Parmesan tomatoes are so easy to make you don’t even need a recipe, but because I love you guys I’m providing the super simple recipe. 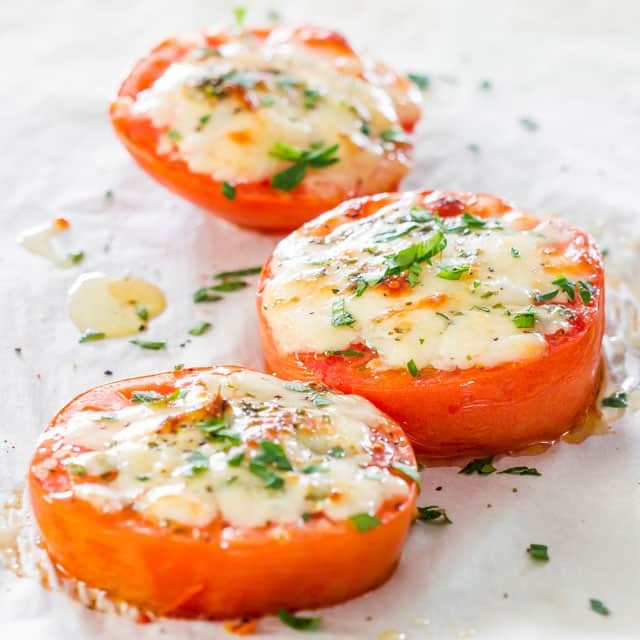 Baked Parmesan Tomatoes - super simple appetizer and a fun way to eat your tomatoes! Magic happens when you pair together tomatoes and Parmesan cheese. Love it! However, the second time around my tomatoes turned mushy with the skin peeling off. Are there certain kinds of tomatoes that are sturdier than others? We find the Roma type tomato is a bit heartier and works with this. You could also buy a firmer tomatoe when baking or grilling as they will work out well. OH. MY. These were amazing. WOW!! I knew these looked good, but I was not expecting them to be so drool-worthy. This is company good. And too easy. I could throw these together any day. Only change was that I cooked 15-17 minutes instead of 8-10 cuz I like my tomatoes really cooked–personal preference. I will be sharing this one! So glad you liked these Tara! I made these tonight after finding the recipe on pinterest. We have a load of fresh tomatoes just ripening in the garden, along with a lively basil plant. I added some of the basil, along with fresh garlic to these and devoured them! So simple, yet so delicious. Thanks for sharing! 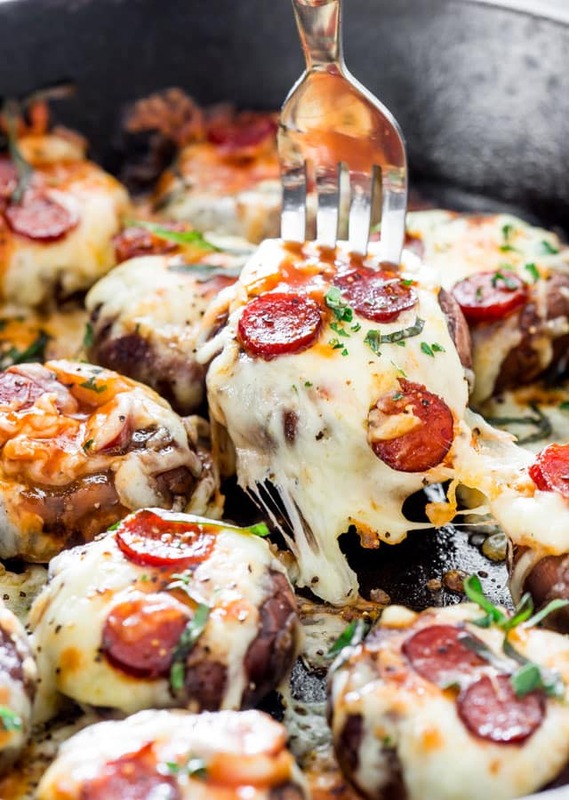 These looked so good but when I made them the tomatoes came out very mushy. Did I do something wrong? I managed to scoop them up and put them on some French bread slices. The flavor was delicious, just wish they were a little firmer. 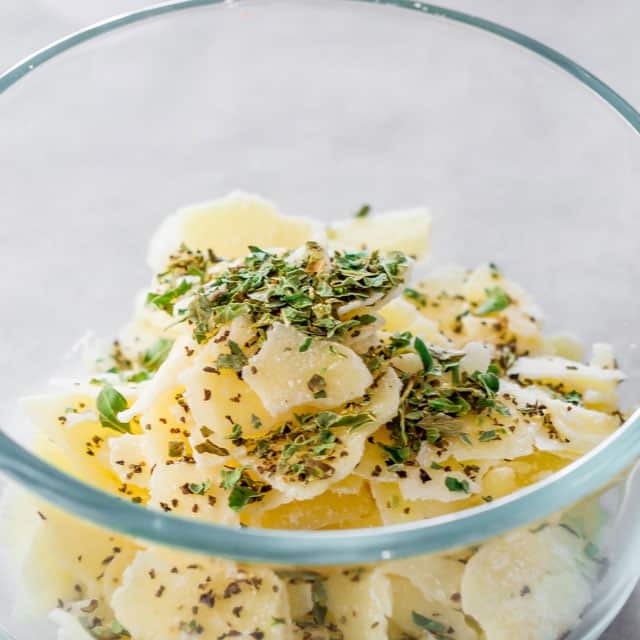 An alternative is to broil them for just a couple of minutes on a foil-lined sheet with a light coating of olive oil on the baking pan. Hi Jo, that looked so delicious! I’m going to give it a try one of these days! Thanks for sharing! 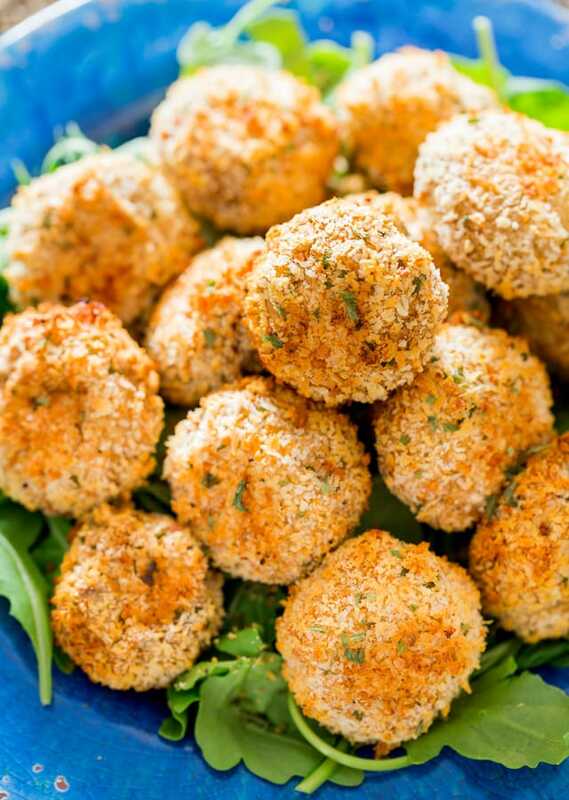 these are absolutely fabulous, but you must add some fresh garlic for an even better taste! i love them! Ha. The tomatoes made me laugh! These look so beautiful and delicious. 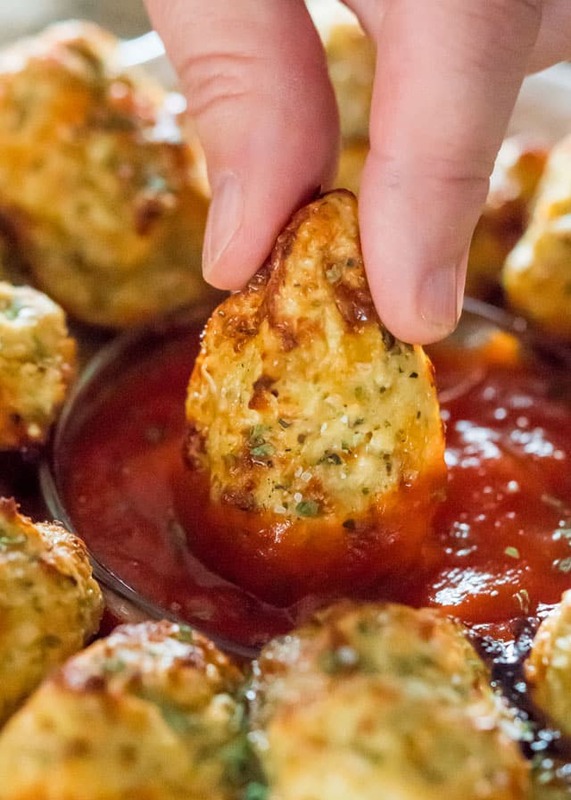 I am such a tomato fanatic I know I will be making these! Thanks for the recipe Jo! I just realized I haven’t made these since I was a private chef and occasionally made versions of these as a side! Thanks for reminding me! They’re beautiful ! Thanks Mimi, aren’t they great?